The memory of a pair of Tamworth pigs who escaped to freedom almost 20 years ago has inspired a wonderful arts project in the Staffordshire town that gave them their name. The 'Tamworth Two' were a pair of Tamworth Sandyback pigs which escaped while being unloaded from a lorry at an abattoir in Wiltshire, before swimming across the River Avon, in January 1998. The pigs, later named Butch and Sundance after the outlaws in the film Butch Cassidy and the Sundance Kid, were on the run for more than a week, resulting in worldwide interest. Their story, which even led to a BBC television drama called The Legend of the Tamworth Two, has now inspired a unique display of public art affectionately called the 'Trotters Trail'. 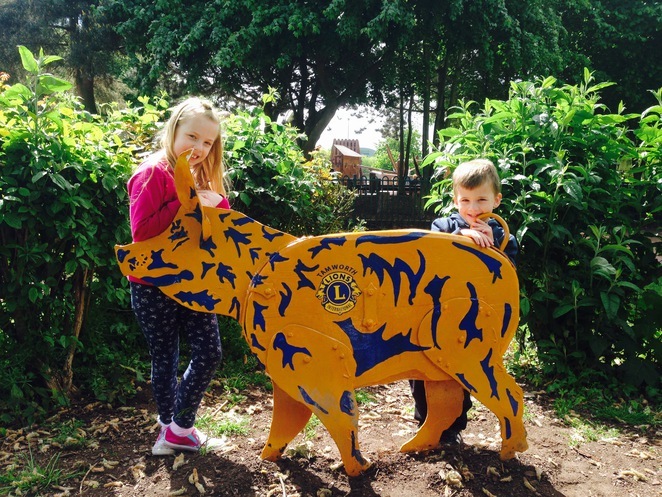 Throughout the summer a herd of 15 replica pigs, each of which has been decorated by schools, community groups or businesses, will be seen at various locations around Tamworth. It is also hoped that the metal and wooden structures, each of which measures around three feet tall and three feet wide, will 'bring home the bacon' when the town bids for a sixth Heart of England in Bloom gold award. Funded by Arts Council England and organised by Tamworth Borough Council's Arts & Events team, the colourful porkers are designed to inspire people of all ages to embrace the arts and get creative in a variety of ways. The Arts & Events team joined forces with sculptor and industrial artist Luke Perry who led workshops with each of the groups as they chose the themes and painted their pigs, either in keeping with their school or group or to represent an element of Tamworth 's history. Members of the public, young and old, are being invited to obtain a map showing where all 15 pigs are located. But among those to look out for are 'Bobby the Peeler' which represents the achievements of former Prime Minister Sir Robert Peel, who helped create the modern police force and whose statue is in the town, and the Tamworth Lions pig which is in the Castle Grounds. Many of the other pigs have been decorated by schools in Tamworth, including St Elizabeth's Primary, Stonydelph Primary, Dosthill Primary, Coton Green Primary, Thomas Barnes Primary, Bird's Bush Primary, and Two Rivers Primary, while others owe their distinctive colouring to the Tamworth Herald newspaper, Tamworth Lions, Dosthill Rainbows and Brownies, Community Café, Tamworth Heritage Society, and the Arts & Events team. Other locations around the town, apart from the Castle Grounds, range from St Editha's Church, Tamworth Community Fire Station and the Snowdome to the top of Tamworth Assembly Rooms, plus various islands and roundabouts. Incidentally, in case you were wondering, the Tamworth Two - which were only five months old at the time of their escape - lived until they were aged 13 and 14 respectively at an animal sanctuary in Kent.